Welcome to another update for Fire Emblem Heroes! Today brings some new challenges and quests to the table. First up, we have new Three Heroes quests to complete, in which you will earn rewards (3-star copies of each of the three Heroes and up to 6 Orbs) for completing specific tasks using Olivia: Blushing Beauty, Corrin: Fateful Princess, and Azama: Carefree Monk. These quests will come to a close on the 20th of December, 6:59AM UTC. Every Thursday sees the release of new Tactics Drills. Today’s new drill is the 19th Grandmaster entry, entitled “Dazzling Trilemma.” Click on “read more” to view the map. I think that’s one of the most specific tips I’ve seen so far in any Tactics Drills. It must be pretty difficult for the developers to think we would need such detailed hints, surely? With 8 phases needed, I’m sure it won’t be a walk in the park for even the most seasoned tacticians out there. 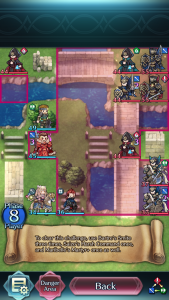 Ah, yes, Three Heroes continues to give me nothing but 450 Feathers, as always. Wish they’d do Units I actually use, though I suppose Olivia at least probably sees a fair amount of play.